When I say I had been subjected to “stimulus progression,” it does not mean I built up my body to have ripped abs and guns – the term sounds like it comes from an intensive CrossFit-like exercise, as alien to me as the words “abs” and “guns.” Neither does “stimulus progression” mean I have been blind to the machinations of some deep state, as conspiracy theorists would have me believe. No, this sinister-sounding team is to do with music, mixed with a large dollop of business and psychology. 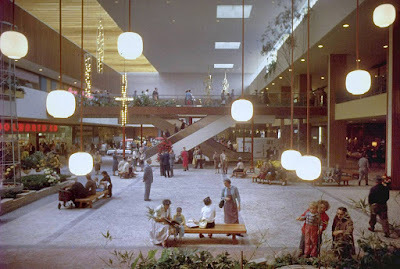 Once upon a time, most music heard outdoors, particularly in the background of shops and other public places, could have been provided by the Muzak Corporation, whose name hoped to evoke the new technology demonstrated by companies like Kodak. The name originally had more to do with how you heard the music: George Owen Squier, inventor of multiplexing for telephone lines as early as 1910, wanted to adapt the process to transmit multiple channels of music, as a way of competing with radio. However, as radio took off in the 1920s and 30s, a series of takeovers built Muzak into a well-known provider of piped music. It benefitted from being owned for a time by Warner Bros., whose vast music archive, built by the film studio as they introduced sound to film in the 1920s, was among the music provided. “Stimulus Progression” was the next stage of Muzak’s development, after the company was bought in 1947 by William Benton, publisher of the Encyclopaedia Britannica (last printed edition published 2012, continues online). The new process grouped specially-recorded orchestral versions of existing songs into fifteen-minute chunks, during which the tempo of the songs played would speed up, and the brass-led instrumentation would become louder and brassier. Each programme would be separated by fifteen minutes of silence, so the listener could not become fatigued. Indeed, the intended effect was to speed up productivity in factories and offices, meaning a bit of ebb and flow was needed. A similar effect was attempted on BBC radio in the UK, as “Music While You Work” provided half-hour programmes of brass-led music from 1940 to 1967, although the music stayed at the same pace, and there were fewer attempts to accuse the BBC of mind control and brainwashing. The downside of the exercise is how the original intention of the song is squeezed out of it. A Muzak instrumental I wanted to buy, from the ominously-titled album “Stimulus Progression 5” (sounding like “Stimulus Progression, Level 5”) turned out to be a version of “Living Together, Working Together,” a song written by Burt Bacharach and Hal David for the 1973 remake of the film “Lost Horizon.” I thought a Bacharach tune could be spotted from a mile off, until now, the changed tempo and unsubtle arrangement turning it almost into its own entity. It’s OK, but it’s no longer what it was. 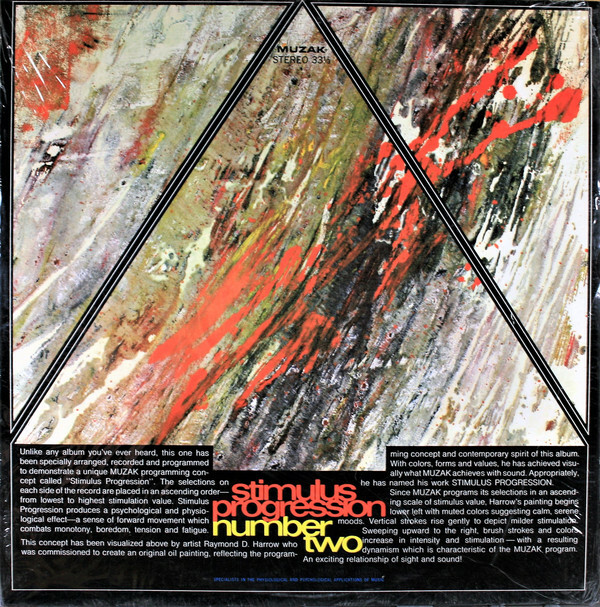 “Stimulus Progression” ended in 1984, when Muzak, taken over by another firm, began programming other peoples’ songs again, in answer to shifting tastes. These days, what is left of Muzak, which has been in and out of bankruptcy, is now available to download by the general public for nostalgia purposes, which is a very recent event. However, anyone listening to their favourite songs hopes for a certain outcome, whether it is “Stimulus Progression” or not.